Our head chef Ben Bass loves nothing more than creating new dishes for our guests at Q Restaurant. 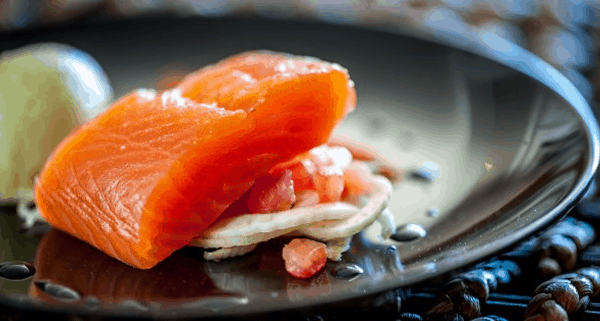 Here’s his recipe for ‘coriander cured salmon with avocado, fennel and smoked tomato’. About this dish Ben says: “This is a really tasty starter or supper for those early autumn evenings. Refreshing and light, this dish is rich without any heavy creams or butters. It’s also gluten and dairy free and full of healthy fats.” Happy cooking. 1.The salmon needs to cure for 24 hours so this recipe does require a bit of forward planning. Firstly, whizz all of the curing ingredients together in a blender, then lay several sheets of cling film down to make a thick wrap for the salmon to sit in. Place the salmon skin side down and cover with the salt mix and wrap up tightly. Place this in the fridge for 24 hours. 2. This dish goes well with a smoky tomato paste. The tomatoes need to be completely dried so cut them thinly and then place then on a low heat in the oven. Once they have dried out, blend them in a food processor with a teaspoon of smoky paprika to make a paste. This can be done the day before or on the day you’re going to eat the salmon. 4. Next make the avocado sorbet by blending everything together until smooth. In the restaurant we freeze this in an ice cream machine but if you don’t have one and are eating the sorbet that day then you can place it in the freezer and stir it every 20 minutes until it has an ice cream like consistency. 5. After 24 hours of curing, your salmon is ready to eat. You can remove the salmon from the cling film and rinse it under the tap. Pat it and dry it and then cut it into six portions. 6. To serve up, thinly slice a bulb of fennel and mix it with a few tablespoons of olive oil, a few tablespoons of lime juice and one tomato that has been skinned, seeded and diced. Spread this across the plate and place the salmon on top. 7. Place a serving of avocado sorbet next to the salmon and decorate the plate with the smoky tomato paste and some peashoots. Q’s Waterside terrace is the ideal spot for lunch, dinner or just an early evening aperitif.